What is a Wasiat (Islamic Will)? Wasiat is a declaration of a person made during his lifetime in respect to his assets or benefit thereof, to be carried out for the purpose of charity or for other purposes permissible by Islamic law after his death. So, as long as the person is alive, the Wasiat, although a valid document, is only effective upon the death of the testator. Some of the key advantages of having a Wasiat is that you can appoint who you want to manage your estate upon your death – this person is called an executor. In your Wasiat, you can appoint a guardian for the property of minor children or a disabled person. You also have the right to give away up to 1/3rd of your estate to your non-Faraid heirs. By having Wasiat one can expedite the legal process to liquidate assets. The executor appointed in your will is also under an obligation to settle all your debts. Lastly, of course, in your will you can state your last wishes and terms of endearment to your family members and loved ones. So, who is an executor? An executor can be an individual or it can be a trustee company. We are a trustee company. It is strongly recommended that a trustee company, like us, is appointed as the main executor of your estate as we are independent. 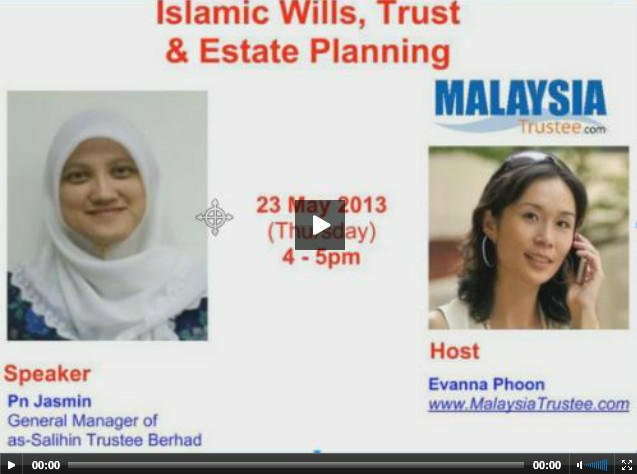 In Malaysia distribution of an estate with a Wasiat is as follows: first of all, as an executor of an estate, you have to settle all debts and funeral expenses. After funeral expenses is settled, you have to settle all debts of the diseased whether their debts is actual or spiritual. Actual debts are your housing loan, credit card loan, and the like. Spiritual debts are, for example, if you are unable to fast during your lifetime, then we have to pay off what we call fidyah. Another is if you did not perform hajj during your lifetime and there are surplus in your asset, then we will basically pay for unperformed hajj. After settlement of all your debts, then your assets will be distributed according to whatever is stated in your will, which is basically Shari’ah compliant for your non-faraid heirs. As stated earlier, you can leave up to 1/3rd of your asset to your non-faraid heirs. After distribution according to your will, then the settlement of any claim of Harta Sepencarian has to be made. Then, after settlement of Harta Sepencarian, only the balance of the asset is to be distributed in accordance to the principles of Faraid.